Recently, she started a catering business — cooking traditional food for people who host parties or celebrations at their houses. She cannot cater for weddings yet (note: weddings in Indonesia are attended by hundreds of people) as she has yet to have the kitchen utensils, serving plates, and cuttleries for that. 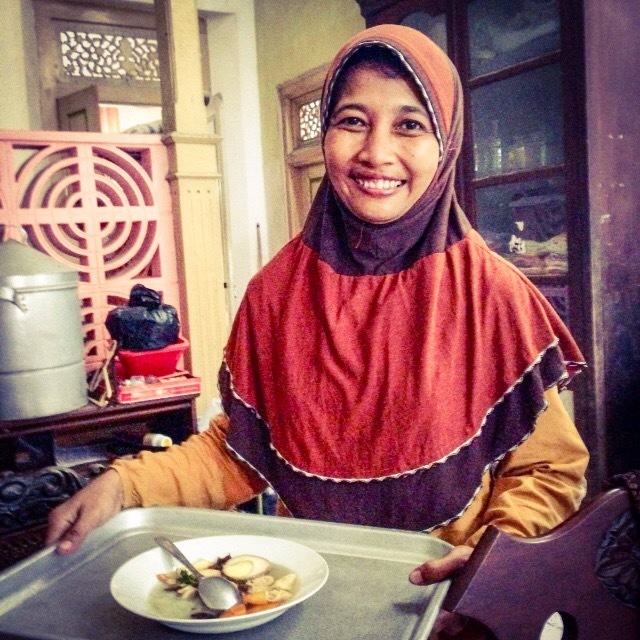 For her catering business, she employs her neighbors who also have simple living. They help shop for the raw ingredients, cook, and deliver food. In return, they can bring home some food to their families and a small wage. “Food is more valuable to them, as that means that day their families can eat sufficiently,” she said. Mbak Yun has five children (one passed away ante-natal). Her eldest is autistic — hyperactive. When he was little, Mbak Yun and her husband took the child by bus to the neighboring city, Yogya, to receive treatment from a specialist. The son now is 21 years old, has received a scholarship, has been accepted without entrance exam to a computer college in Solo and has a talent in arts. When the son wanted to buy a new computer after the previous one was broken, he went about the neighborhood to sell tofu on stick until he can make credit purchase for his computer. Mbak Yun is often invited to schools to share her experience and support other parents with special-need children. In addition to her three children, Mbak Yun also takes care of her orphaned nephew. Whenever I visit her house — she lives with her in laws — she and her brothers/sisters always serve us with an abundance of food for us to dine there and to take home. She also acts as the head of the local neighborhood. Her face is always filled with a smile and optimism. Her gesture is responsive, efficient and always ready to serve. She spends no time in nonsensical talk, but remains courteous and logical. One of my teachers in life.